By the time I met this couple from Schaumberg, Illinois I felt that they were friends. 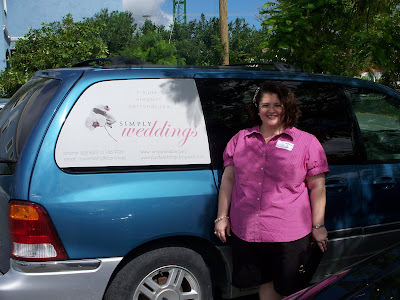 Here is the lovely bride posing next to my van (with it's new sign!) while I went in to the government office to apply for their Special Marriage License. 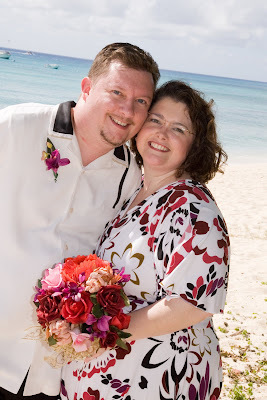 After planning this wedding for months, both the couple and I were worried about the after effects of Hurricane Paloma. 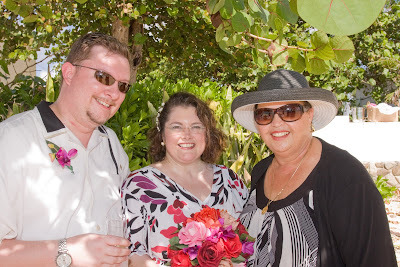 Fortunately Seven Mile Beach was not affected and 11 November was perfect "wedding weather". 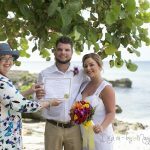 The couple had friends photograph their wedding, and they got some great shots like this one on the beach wall at Mary Molly Hydes Road. 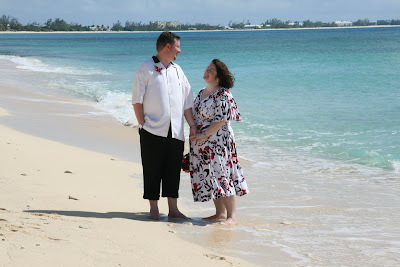 The Ceremony included a Unity Sand Ceremony. 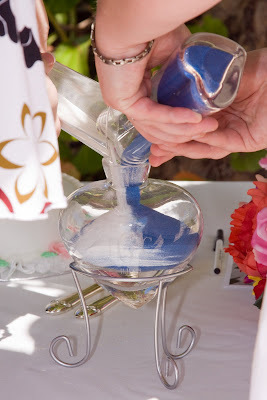 I loved this Sand Ceremony set which they brought with them, it was definitely the nicest one I had seen. 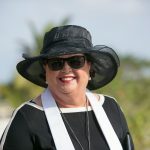 Can you believe it, this couple bought me a new hat! I will post a picture soon, but I can tell you know it is red with black trim (Italian wool!) Looks very smart, I am wearing it this weekend for sure. This bride made her own bouquet of silk roses, colour co-ordinating it to her dress. 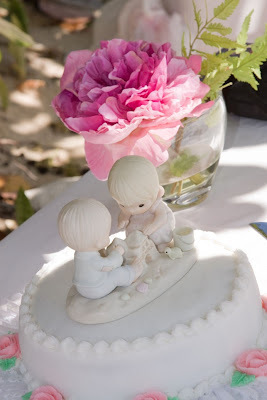 She also brought the cutest cake-topper with a little bride and groom building a sand-castle. 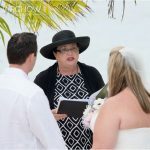 I will send you an application form, details of the $200 deposit you need to book your date and time and begin working with you to customise your ceremony. 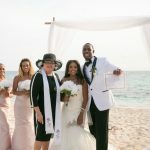 This wedding, ceremony by Joy of Weddings, arrangements by Simply Weddings, flowers by bride, photography supplied, cake by Miss Vivene's cakes.